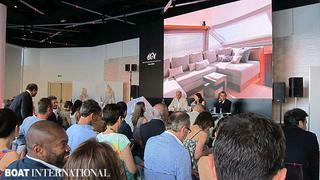 As we announced in May, this weekend saw the world première of the first Monte Carlo Yachts 86 in Monaco. The yacht was revealed to the press and a selection of guests during a gala dinner. The young and ambitious brand, part of Bénéteau Group, began with a team of only 20 - now Monte Carlo Yachts (MCY) will count 280 employees in 2014, with a turnover scheduled to exceed €48 million. The MCY 86 is the new flagship of the fleet, joining the already popular MCY 65, 70 and 76 models, all of which are designed by the Italian duo Nuvolari-Lenard. The 26.3m composite motor yacht MCY 86 offers more volume and a higher level of customization than her smaller sisters. Designed as a real mini-superyacht, the MCY 86 follows the exterior styling and interior concept already developed in the range, making her immediately recognisable as an MCY. The MCY 86 impresses with her beam of 6.46m, giving generous volumes to all exterior areas from the aft deck to the sun deck, to her artfully arranged lounge foredeck. Inside, large windows and portholes bring in natural light, including her crew quarters. Famous French and Italian furniture from Hermès, Armani and Poltrona Frau compose the contemporary interior designed by Nuvolari-Lenard and entirely customized to the owner wishes. Multiple layouts are possible for all decks accommodating six to 10 guests in three- to five-cabin versions. The four-cabin version was chosen on the first hull of the MCY 86, offering a layout with a separate owner area including a full-beam master and a twin, both amidship, and a guest area aft including a VIP and a twin. Both twin cabins are convertible into double berths, and Pullman beds are possible, allowing up to 12 guests on board, and making her an ideal candidate for a pocket superyacht on the charter market. Another detail rarely seen on a yacht of this size, crew quarters are independent with a separate access, leaving 80 per cent of the yacht to the guests. Set forward, they are composed of the galley, a lounge and two cabins accommodating three members. Powered by twin 1,342kW MAN engines, the MCY 86 motor yacht achieves a top speed of 29 knots and a cruising speed of 22 knots. The engine room offers generous volumes for a yacht of this size, giving easy access to all equipment; engine room space can be increased if the owner chooses to forgo the stern garage option and store tenders on the hydraulic stern platform. Her high level of customisation offers many options such as side balconies, carbon-fibre hard top, a Jacuzzi on the sun deck, Seakeeper stabilisers, stern tender garage, etc.... The first MCY 86 has all of them, giving a good idea of the high standards offered by the Italian yard. The first MCY 86 is now ready to be delivered. She will also make her official debut at the Festival de la Plaisance of Cannes in September. The yard also confirmed that two other hulls are under construction and larger projects are already on the drawing board.